Stetson Professor Michael Denner, Ph.D., advises student Ashton Craig. Denner is director of Stetson’s Honors Program. Ashton Craig was an excellent student coming out of Flagler Palm Coast High School’s International Baccalaureate curriculum, compiling 14 college credits along the way. She had hopes to immediately attend a university; yet, also there were economic realities. So, Craig enrolled in the Daytona State College Quanta-Honors program. Now, Craig is a junior at Stetson in the university’s Honors Program, where in four semesters she is scheduled to earn a bachelor’s degree in English. Craig calls Stetson the “opportunity that I’ve been seeking out so much for the past two years.” Eventually, she notes, she’ll perhaps become a professor or go on to law school, or maybe medical school or into business administration. There are options. Carol Baugher “never expected to go to college.” Baugher grew up in an orphanage and was on her own by age 13 in Macon, Georgia. That was more than four decades ago. “I never knew the way to further my education,” described Baugher, who only finished eighth grade and later obtained a high-school equivalency diploma. Through the years, there were attempts at education. In 2005, she became a nurse, but “life always happened,” she noted, citing family challenges. Finally, last spring Baugher received both an Associate of Art degree and an Associate of Science, while also serving as Student Government secretary at Daytona State, which “opened up the door for Stetson.” In August, she began in Stetson’s Honors Program. Craig and Baugher are two of 15 students from Daytona State, who have arrived at Stetson this fall by virtue of an automatic-admission agreement. As a result, what’s commonly referred to as the leaky pipeline in higher education is being closed. Nationally, fewer than one in seven students with an associate degree transfer to a four-year college and earn a baccalaureate degree, according to published data. And even when they do transfer, there typically are multiple academic, social and financial obstacles to overcome. By contrast, Stetson is helping students beat the odds. Notably, each Quanta cohort at Daytona State consists of up to 75 students at the start, with approximately 45 students making it through the second year. Of that total, “100 percent” transfer to continue their education, Karda cited. According to Stetson Professor Michael Denner, Ph.D., director of Stetson’s Honors Program, that track is carefully planned, depending on academic major. Curricula at Stetson have been designed to enable students to graduate from the Honors Program in four semesters for certain majors. Also, extending beyond traditional matriculation agreements, Stetson faculty members advise students about course selection and preparation from the time they first enroll at Daytona State — providing students with a list of classes they must take to eventually complete their bachelor’s degree from Stetson. “I wanted to work with these students starting before they registered for their first classes at Daytona State,” Denner said. An example: For students with declared biology and philosophy majors, seven or eight courses were prescribed during their two years at Daytona State, effectively making fall 2018 the start of year three in the program. At Stetson, the students have only six courses to complete their major. Since the Daytona State transfer students take about 16 courses during their four semesters at Stetson, that gives every student the flexibility to complete their degrees with plenty of elective courses and Honors courses, Denner explained. While there should always be an asterisk next to the word “guarantee,” with variables such as due diligence and academic performance in play, this “all-in series of events” leads to timely graduation, Denner added. Students who succeed at Stetson and receive a good score on the LSAT are further guaranteed entry into the College of Law (a continuation of the program). “I can’t tell you the value of just being able to pick up the phone when a student has a question or problem, of the little stuff that always comes up. I know who to call,” Karda said. “At Quanta, we’re building relationships both horizontally among students and also vertically between students and faculty and between students in this institution and the Stetson community. Geographic proximity also plays an important role. Located 20 miles apart, Daytona State and Stetson each are embedded in the local community, in turn, providing a viable local option for continuing education. Karda points out that although similar agreements are in place across the nation — such as linking veterans at community colleges with selective Ivy Leagues institutions, on a limited basis — this program can be duplicated nationwide, as long as institutions team with other institutions in the region. In addition, expansion is on the horizon. In fall 2019, a scripted curriculum is expected to be in place for accounting majors, as well as a study-abroad component for all students. Also, the Honors Program is busy developing a study-abroad option in the Dominican Republic, open to any student in the Honors Program. 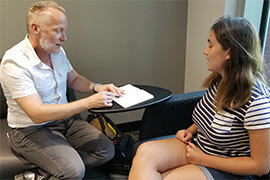 Since this faculty-led exchange would be inexpensive and short-term, it would offer Quanta transfer students an option for experiential learning abroad that might otherwise be inaccessible, according to Denner.